Listen to fife and drum corps from all over the nation as they march down Main Street. Following the parade discover more history by taking a tour of the Old Manse, or by visiting the Concord Museum. British reenactors will conduct a very moving 'Mourn Arms' ceremony in honor of the British dead, buried at North Bridge. Following this, they will be joined by the Acton Minutemen and other local companies for a special commemoration featuring musket salutes. British reenactors will be joined by the Acton Minutemen and other local companies for a special commemoration of the North Bridge Fight featuring musket salutes. The Concord Parade will arrive at North Bridge around 9:30 a.m. 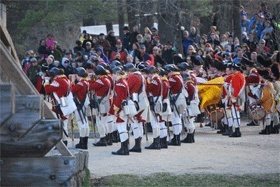 The Concord Parade steps off at 8:45am andwill arrive at North Bridge around 9:30 a.m. Listen to fife and drum corps from all over the nation as they march down Main Street to celebrate Patriot's Day. Following the parade, discover more patriotic history by taking a tour of the Old Manse, or by visiting the Concord Museum. The parade route winds from Concord Center, and passes over the North Bridge before returning to town. At the North Bridge, the parade will stop for 'Old Glory’s Journey of Remembrance' to honor the service and sacrifice of America’s fallen heroes with a flag-raising ceremony. Visit the Manse from 11:00am – 5:00pm. House Tours: Members: Free. Non-members: adult $8, senior/student $7, child $5. shot heard round the world battle reenactment at North Bridge at 8:45 with parade to immediately follow. Parade arrives at 9:30am.